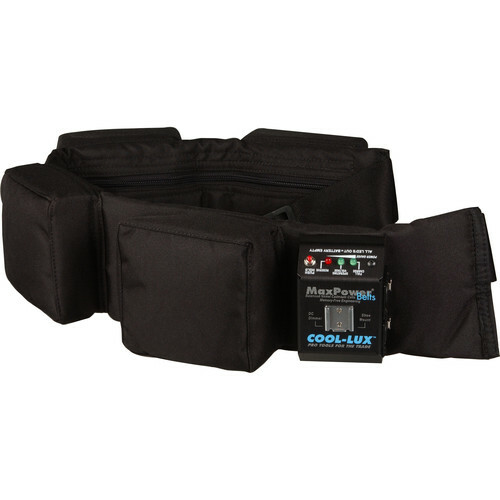 The Cool-Pix NC-1484 MAX Power battery belt offers a 14.4V high performance NiCd battery. The NC-1484 when properly maintained will offer a consistent run time over the life of the battery. Heavy-duty 16-gauge wiring is utilized with slip-proof connectors to ensure a long, reliable operating life. The 14.4V design of the NC-1484 complies with equipment manufacturer's specifications, eliminating 12V battery problems. The NC-1484 is designed in a 14.4V configuration with a full discharge rating of 12V. Therefore, the NC-1484 will deliver its full capacity before the camera reaches its cutoff point. Part of the Black Tie Edition, the NC-1484 is designed to be worn comfortably for hours upon hours. The belt wears elegantly under a suit or tuxedo jacket without looking obtrusive. The belt can be fully adjusted to fit snuggly around the operator's waist with an adjustment range from 34" to 56". A row of three, LED lights offer the operator a close approximation of the current battery condition. Dimensions Fits waist sizes 34" to 56"
Box Dimensions (LxWxH) 18.2 x 7.1 x 6.4"
NC-1484 Battery Belt, NiCd 14.4V/100.8 Wh is rated 5.0 out of 5 by 1. Rated 5 out of 5 by Anonymous from Lightweight, long-lasting power This battery belt is great because it's very lightweight and last. The belt is easily adjustable and very comfortable. I videotape a lot of nature stuff so it's essential that I have power all day - this belt offers great performance.